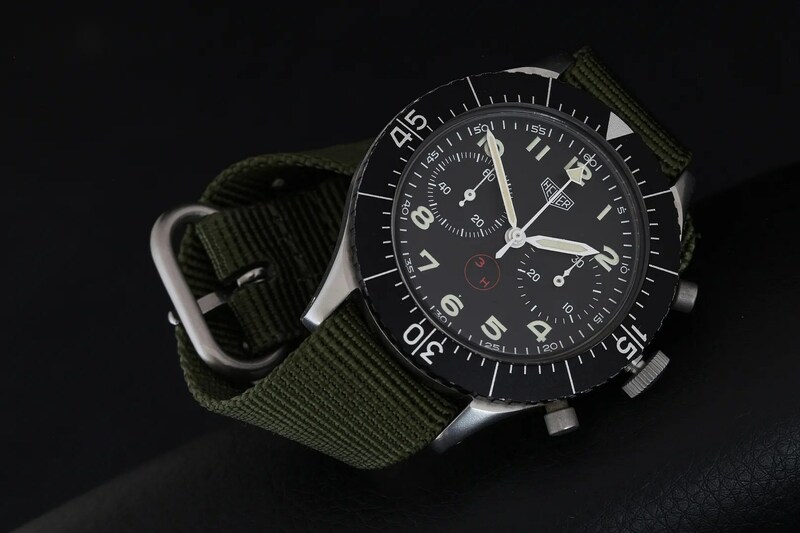 Well, I’ve been mulling over strap choices for the Bundeswehr, which when I bought it was on a Sinn bund strap (with the pad) and looking pretty authentic as a consequence. I found the pad to be a little too much to carry off, though, and tried it on the strap alone for a while. It still wasn’t singing to me, and after a couple of suggestions were made on TZ-UK I ended up buying an olive green Zulu (style) from Crown & Buckle. I’ve never had an olive Zulu/NATO although I’ve wanted to try one for a while, and the moment I put it on the watch I knew that it was the perfect match. I like nylon straps at the best of times, but I absolutely LOVE this combination. This entry was tagged Heuer. Bookmark the permalink.